Vidyartha College shocked a St. Peter’s College side that looked a shadow of its once dominant self, by marching to a stunning 32 (2 goals, 3 tries, 1 penalty) – 22 (2 goals, 1 try, 1 penalty) victory, at their opponents’ home ground in Bambalapitiya yesterday. The score line, which at one point read 32-8 in favour of Vidyartha, would have brought further humiliation had it not been for a second half Peterite rally that came way too late in the game. Vidyartha came hard at St. Peter’s from the opening whistle. Pic by Ranjith Perera. Vidyartha for their part seized their opportunities with flawless execution, which led to tries from Winger S. Ranawickrema, No.8 W. Dissanayake, Full Back Asela Bandara, Winger Chalana Samarawickrama and T. Perera. 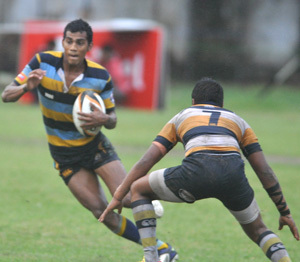 In reply, St. Peter’s got three tries from Winger Bhanuka Peiris, Winger Steve Dharmaratne and Flanker R. Jansen. For long spells the Peterites resembled the walking dead, launching into soft tackles and mishandling passes at crucial passages of play. It was merely up to Vidyartha to step up and make them pay, and they mercilessly obliged right from the beginning of the game. Ranawickrema burst through a seemingly hapless Peterite defence to fly over the line in the very first minute of the game. He was followed in quick succession by Dissanayake, whose try, like that of Ranawickrema’s, was unconverted by Scrum Half Chamath Fernando, and before the home crowd could catch their breath it was 10-0 with only eight minutes of the match gone. A Fernando penalty later, and St. Peter’s finally awoke. It started with a penalty from Dulaj Perera in the 29th minute. Then, after repeatedly keeping the ball stagnant on attack, St. Peter’s finally passed it down the line and it yielded an immediate try from Peiris, which Perera could not convert. As the players came out in the second half, with the score 13-8, they were greeted by a heavy shower. However, St. Peter’s was also met by a downpour of a different kind. Within a little over 20 minutes, Bandara, Samarawickrema and Perera all sailed over the try line for Vidyartha as the Peterites’ expression descended from frustration to helplessness. However, they did strike back through a period of inspired play, when first Dharmaratne and then Jancen managed to burst over the line in the 34th and 39th minutes for two converted tries, courtesy of Perera. By that point though, the Vidyartha supporters were already preparing to light the fireworks that would herald an extraordinary victory.